It's a good thing I finished this project up the other day and got the second coat of tung oil on it yesterday. 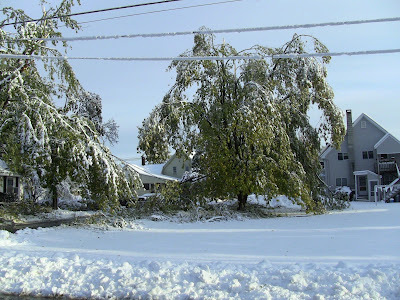 We have no power now, along with 2-3 million other people in Massachusetts, New Hampshire, Connecticut, New York, New Jersey, and Pennsylvania. Last night we got about 8" of snow. Since the trees still have leaves on them, they got heavily laden, resulting in outages all over the place. Ours went out just before midnight, and may be out for a couple days. I'm writing this at the awesome Life Alive vegetarian cafe in Lowell. Thanks for the free Wi-Fi! Branches are down and pulling on wires like this all over. 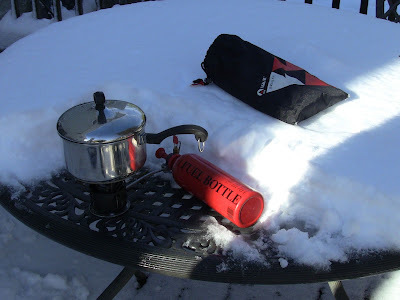 Making the morning cup of coffee with my old backpacking stove. 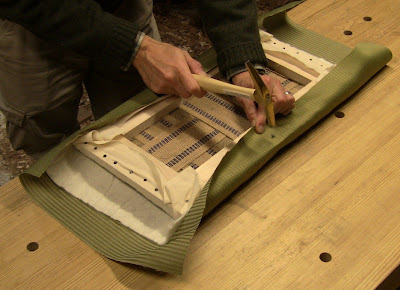 The last task for the project was to upholster the slip seat. 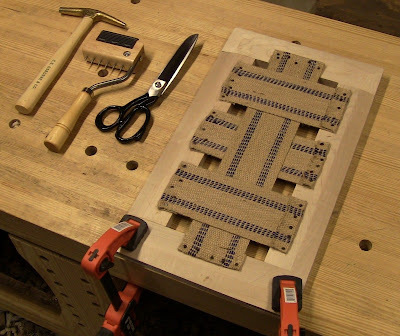 It requires some specialized tools that I ordered along with my upholstering supplies. 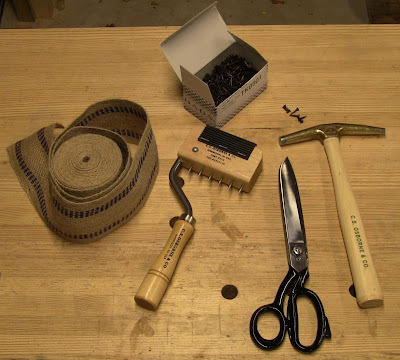 Clockwise from left: seat webbing, tacks, tack hammer with one magnetic tip, fabric shears, and upholstery stretcher (no, not some medieval torture device). 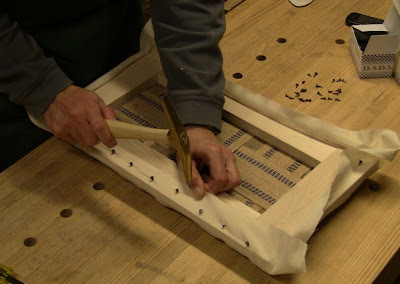 Tacking one end of a piece of webbing to the frame. The magnetic tip of the hammer holds the tack as you take one swing to stick it in place. The tacks have a very sharp whisker tip. 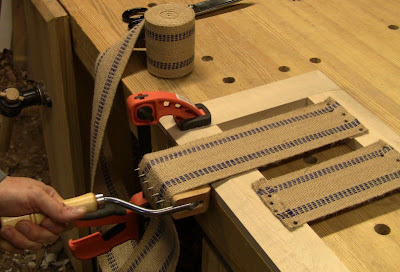 Using the stretcher to tension the webbing so I can tack the other end. The completed webbing in a weave pattern. 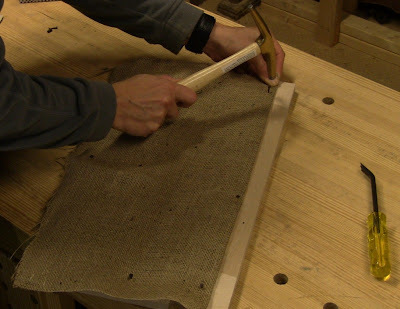 Marking out the burlap with fabric chalk. 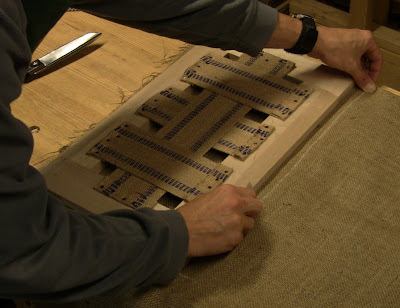 Tacking the burlap down over the webbing. This keeps the padding material from coming out the bottom. 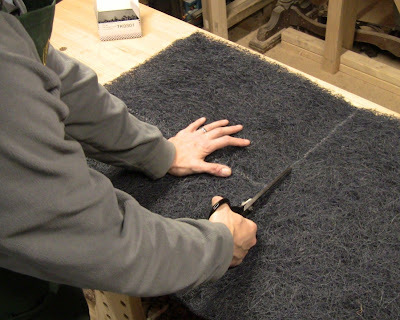 Cutting a pad out of rubberized horse hair, a more economical alternative to real horse hair, and probably easier to handle. I'm not sure what this is made out of, but it looks to me like the same stuff they sell for duct filters. 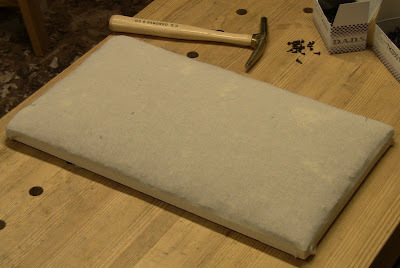 I realized later I should have beveled the edges of the pad so they would be nice and rounded under the fabric. 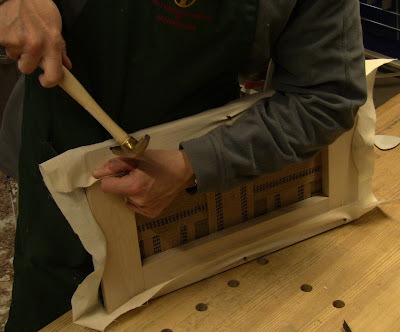 Tacking down the corner of the muslin that holds down the horse hair. Subdividing each space until I have a tack every 3/4". The stretched muslin. Note the top edge of the padding underneath visible. Tacking down the decorative outer fabric, with a layer of cotton quilting batting over the muslin. 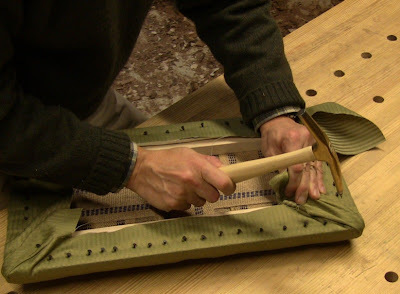 Tacking always start at the center, then stretch lightly to the corner to avoid wrinkles. Pulling the corner up tight to tack it down. 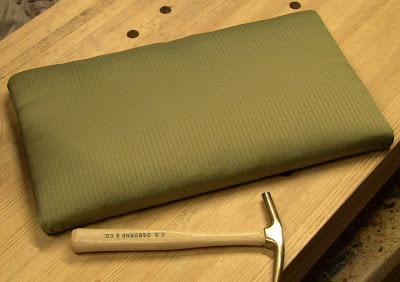 The finished slip seat top. It's a little lumpy along the edges, but not bad for my first attempt. 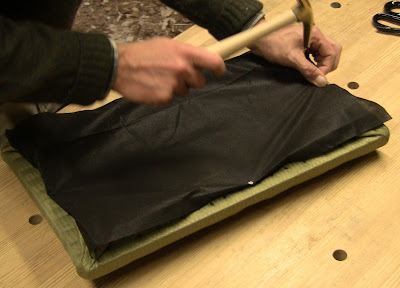 That's where I should have beveled the edges of the rubberized horse hair pad. 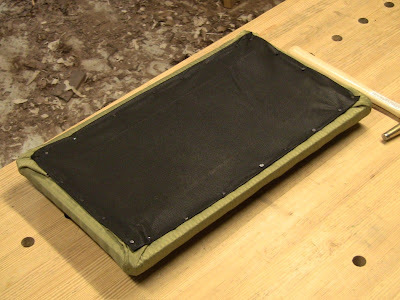 The last layer is a simple dust cover on the underside. This doesn't have to be as careful a job. The cover fully tacked in place. 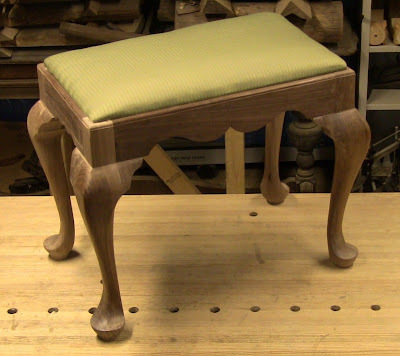 The completed stool before finish. And finally, the glamor shot that I'll use for the official submission photo. Without power, I had to improvise a photo setup by spreading the white backdrop on the bed headboard and using the camera flash. 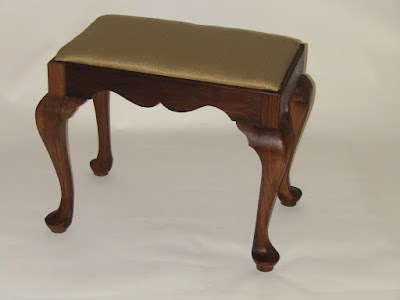 The completed stool with two coats of 100% tung oil. This was a challenging and time-consuming project, but I picked up a number of new skills. The knee blocks added another hour or so per leg. Total time probably came in around 40 hours. The next one will be faster now that I've shaken out the process a bit. Very nice job. And thanks for sharing. I found the part 5 details to be especially interesting. Nice job Steve. This looks like it was a fun project that while a little time consuming on the details is a great entry to the period form. 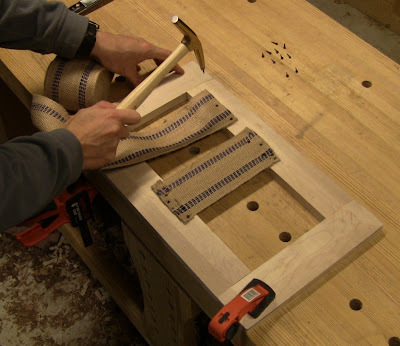 So...when do you build the matching chair? Great job Steve, hope you get power back soon. We didn't lose it here in SE Connecticut, but much of the northern part of the state is 100% w/o power. I have a pair of gooseneck arm chairs that could use a pair of these. Always great when you get to mark something as "finished." Thanks! My next chair will probably be a Queen Anne side chair. I really liked the one Phil Lowe built, and picked up a lot of details from Matt Wajda's presentation, so I'm itching to do it. This made a good introduction to many of the techniques. Simply beautiful, Steve. And the step-by-step instructions and photos are fantastic. Well done! GREAT tutorial. I'm adding to my google reader. Thanks! Thanks Kari and Vic! The power came back on our street Halloween night, though it still remains out for many people. Thanks for the tutorial. Sorry if I missed it, but could you please tell us where you got the upholstering equipment? Thanks! I got everything except the cover fabric from DiyUpholsterySupply.com. Delivery was 3 weeks, with 2 items drop-shipped directly from manufacturers.